Winter can be a difficult time for birds. The days are short, and nights are often cold and long. The natural food supply has been consumed or is hidden by snow. Most insects are dead or dormant. Water can be hard to find, and food needed to provide the energy to keep birds warm might be scarce. Finding shelter may not be easy. If there are limited natural evergreens or shelter, birds may seek man-made houses or habitats that can provide refuge from the winds, rains, ice or snow of winter. 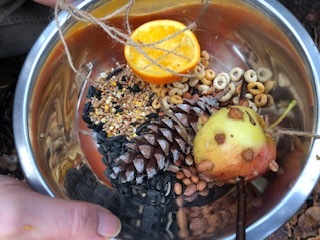 Make bird food and feeders as a gift to the wood and some for you to take home. We will meet outside the cafe.